Here's my card for the current sketch at CAS(e) this Sketch. This one's super simple--just stamps, ink, markers, and paper is all it took! 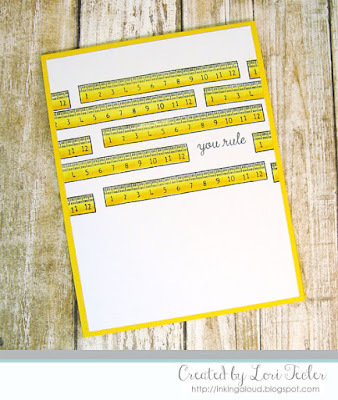 I started by stamping the "you rule" sentiment from Reverse Confetti's Worm Wishes stamp set on a white cardstock panel. The words were surrounded by the set's ruler image, stamped repeatedly on the panel using black ink. I purposely staggered the ruler image and didn't line it up exactly to add interest. The ruler images were loosely colored with several yellow Copic markers. I adhered the finished panel to a coordinating yellow card base to finish the design.